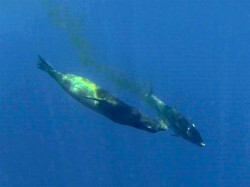 The 2011 Galapagos Islands fishing/filming expedition has begun. Follow Capt Andy LoCascio for 15 days of fishing in the waters around San Cristobal, Ecuador. 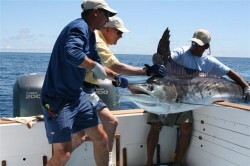 There will be daily posts and pictures in the Galapagos 2011 Traveling Angler section. 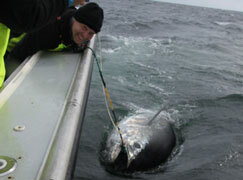 Capt Andy will be tweeting every day. Click here to see the latest report! A quick pic moments before release! This will be 7th trip to the islands for Capt Andy. 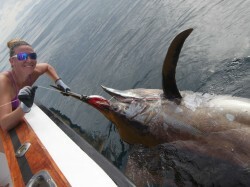 The waters surrounding San Cristobal have best marlin bite in the world including the largest striped marlin found anywhere. Monster yellowfin tuna are everywhere and Andy’s host Pete Santini boated a potential world record 357lb bigeye tuna a few days ago. 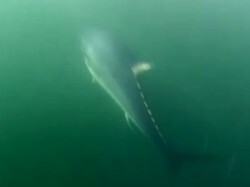 Three separate groups of anglers will each be spending a few days experiencing what looks to be one of the best bites in many years.